AFRICANGLOBE – Nine years after cashing her $10,569,000.10 cheque, lottery winner Sharon Tirabassi is catching the Barton Street bus to her part-time job. She’s working to support her kids in their rented house in northeast Hamilton. 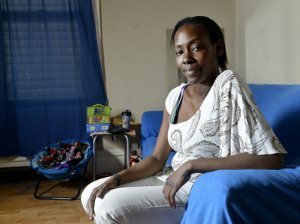 Tirabassi, 35 — one of this city’s biggest lotto winners — has gone from rolling in dough to living pay cheque to pay cheque. The Lotto Super Seven payout didn’t come with a financial adviser and before she knew it — big house, fancy cars, designer clothes, lavish parties, exotic trips, handouts to family, loans to friends — the money was gone. “You don’t think it’ll go (at the time), right?” she says. She’d check her account now and again, but there were always so many zeroes that she figured it was fine — until one day there was just three quarters of a million left. She’s happier today. Says life has more purpose now than when she was shopping. She’s working part-time as a personal support worker and raising her six kids in a rented downtown house off Barton and Sherman. Her husband, Vinny, also 35, has another three kids from a previous relationship. Asked about how life turned out for them, Vinny shrugs, smoking a cigarette in the doorway of their rented home. Pretty much all that’s left now is in trust for her kids when they turn 26 — her children will be OK, and that’s what’s important to her. “The moment I got it, I divided it among my family … all of that other stuff was fun in the beginning, now it’s like … back to life,” she says. Before her win, Tirabassi had been living in an east Hamilton apartment with her three kids, each one from a different father. She was Sharon Mentore then — not yet married. She had just landed a job as a personal care provider, fresh off welfare, and couldn’t afford a car. But on Easter Weekend in April 2004, she literally hit the jackpot and won $10.5 million from a Lotto Super Seven ticket. For someone who spent her teenage years bouncing around from shelter to shelter, she was unprepared for the millionaire lifestyle. That cheque might as well have been a money tree in the yard — it felt like cash for life. Suddenly, life was but a dream. She took friends on wild, all-expenses paid trips to Cancun, Florida, Las Vegas, California, the Caribbean. She bought a house on West 5th, and she married Vinny. In 2006, the newlyweds and blended Tirabassi family moved to a massive $515,000 home on Kitty Murray Lane in Ancaster. Despite cashing a $10.5 million cheque just two years earlier, Tirabassi took out a $360,000 mortgage on the house. The pair, Vinny says, owned four vehicles: a bright yellow Hummer, a Mustang, a Dodge Charger and a $200,000-plus, souped-up Cadillac Escalade — Tirabassi’s baby. Her customized licence plate read “BABIPHAT,” after one of her favourite designer clothing lines. Ancaster neighbours hated that Cadillac. Equipped with interior turntables and sound mixers, it blared hip-hop music in the driveway and shook their quiet suburban street. Tirabassi didn’t like her neighbours. “They didn’t like young people,” she says. Besides the extravagant vehicles, a lot of the cash went to family and friends. Too much, she admits now. She gave her parents $1 million. Another $1.75 million was divided among her four siblings. She bought several houses in the city, renting them out at affordable rates to families. She said she paid people’s rent. Lent money to help out a friend when her husband went to jail. Helped another two friends start up a business in Toronto. A lot of friends came out of the woodwork when news broke of her win — and a lot of them she never heard from again. “Money is the root of all evil,” she says, shaking her head.